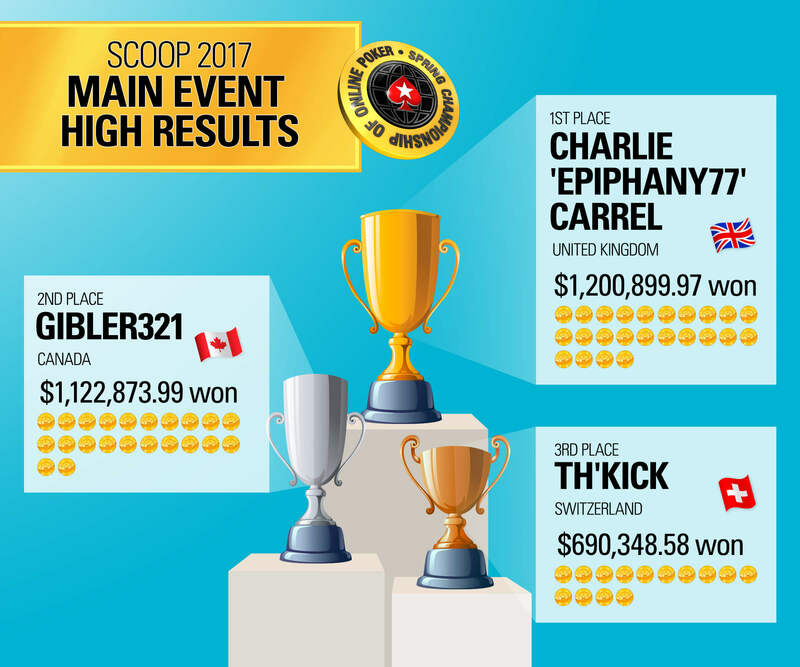 The Main Event High (SCOOP-55-H: $10,300 NLHE Main Event) smashed its $5 million guarantee to reach a $6,930,000 prize pool and made both winner Charlie ‘Epiphany77’ Carrel and second place ‘gibler321’ millionaires. Well-known British high-roller Carrel took home $1,200,899.97 with ‘gibler321’ cashing for $1,122,873.99. The PokerStars blog report can be read here. Carrel, who has already bagged a 2017 SCOOP title after winning $67,410 in the $1,050 PL Omaha H/L Event 16 High, was playing while in Mexico and due to connectivity issues was sprinting to different cafes desperately asking if they had Wi-Fi so he could avoid blinding out. With the agreement of Carrel’s fellow final table players, the tournament was delayed by 30 minutes in order to allow him to find a stable connection so he could carry on playing. He said after his win: “I actually feel super happy. I never usually get much of an emotional reaction, but this one really felt like it had a real story behind it. The structure and the field were so good, it was kind of perfect. Event-01-H Phase 2 also had a million dollar first prize with an overall prize pool of $5,821,000. In a rare five-way deal, the five players all took home a prize of over $400,000. First place ‘holla@yoboy’ won $692,460.93 and second place ‘girafganger’ cashed $745,000. Poker players from all over the world played in 57 events from April 30 across SCOOP’s three stakes: Low, Medium and High. 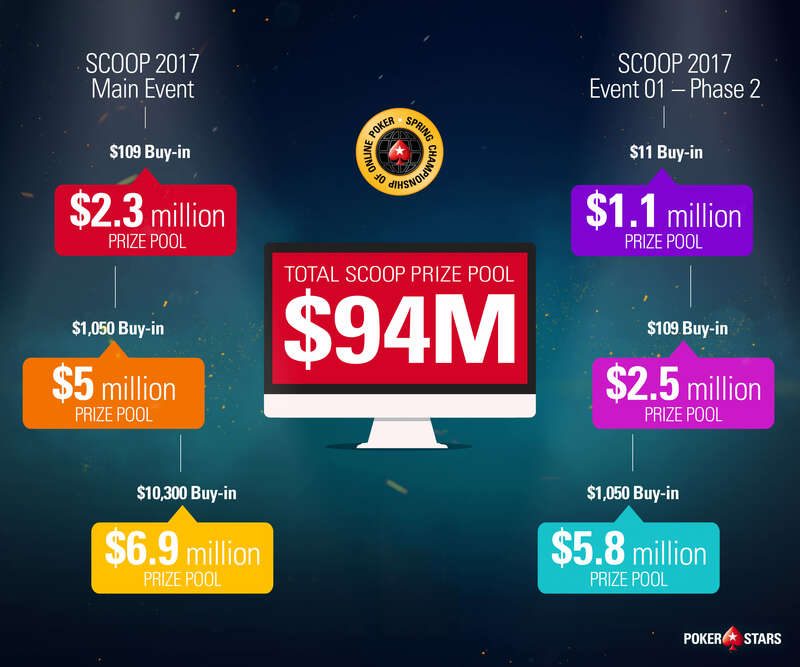 In addition, on Sunday SCOOP events contributed to the biggest day in online poker’s history delivering more than $29.5 million in prize pools. The record-breaking day gave away $39 million in tournament prize pools, including SCOOP and regular tournaments. As well as Carrel, ‘Gigaloff’ won two SCOOP events this year topping the field in the $1,050 Event 22-H Limit Omaha and $215 Event 14-M Limit Razz. Other notable players include ‘cal42688’ who won the $530 Event 13-H Zoom Progressive KO bringing his total SCOOP titles to date to eight, making him the first ever player to gain eight SCOOP titles, and ‘chilenocl’ who successfully defended his title in the NL Shootout tournament winning $93,720. The final SCOOP tournaments are currently underway and five players are still in line with winning two SCOOP titles this year. NJSCOOP’s Main Event High was the biggest ever tournament in New Jersey, with a prize pool of $204,450. The total prize pool of $1,448,707 made NJSCOOP the biggest online poker series ever seen in New Jersey. To get the full lowdown on SCOOP go to the PokerStars Blog.